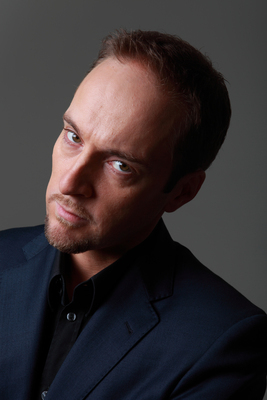 The manipulator of magic and mind control, Derren Brown, is bringing his sixth live stage tour to Birmingham's New Alexandra Theatre in May and promises that it will have a different tone to his previous outings. 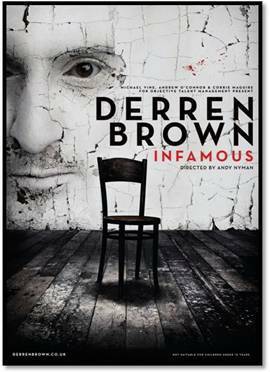 Derren Brown: Infamous is the latest illusion show from the winner of two Olivier Awards (for Something Wicked This Way Comes in 2006 and Svengali last year). His antics so far have included convincing middle-managers to commit an armed robbery in the street, led the nation in a séance, successfully predicted the National Lottery, motivated a shy man to land a packed passenger plane at 30,000 feet, and hypnotised a man to assassinate Stephen Fry on TV shows like Mind Control, Trick of the Mind, Trick or Treat, Russian Roulette, The Heist, and Apocalypse. Born in Croydon in 1971, Derren abandoned a career in Law after graduating to concentrate on developing his skills at psychological magic. But it was in 1999, when Channel 4 asked him to put a TV show together that Brown got his big break and developed a unique brand of mind control, suggestion, showmanship and illusion. When asked about touring, Brown says: "It's still my favourite thing to do. Everything – from the writing of the show to the actual performing and touring – is a huge delight." "Andy Nyman was my co-writer for many years of television shows. Now we've joined forces again, we're very eager to make this show feel different. There was something of a template we followed with all the shows, which worked very well. "It's rather exciting and scary leaving that behind. This one should certainly have a different tone, and will mix things up a bit for those who have seen the others on TV or live. "I just try to find what's interesting to me, while of course making sure I don't repeat ideas from previous shows. This year as we've tried to change the feel of the show, that has brought its own concerns – how much should you change for the sake of changing? Why fix what wasn't broken? " "But these are all part of the creative drive: complacency doesn't help anyone." Brown has attracted his fair share of controversy, but this doesn't phase him. "It's nice that the shows are very well received," says Brown. "I'm used to them also provoking their share of negative or sceptical reactions from some quarters – anything from 'it's all fake' to 'it's irresponsible and he shouldn't be doing it'. "I see it as an inevitable kind of tax I pay for doing something that might be very ambitious. It's only saddening when I see people – usually on Twitter – wrongly dismissing something that happened for real as fake and feeling insulted rather than letting themselves enjoy it. But whaddyagonnado… you could go mad trying to please everyone."